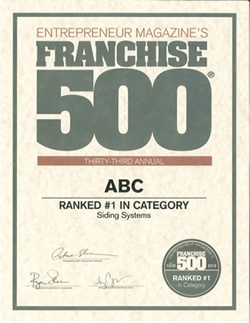 This year ABC Seamless received top honors as the number one siding systems franchise, a position they have held since 2008. They were also named one of the top 500 franchises in the United States by Entrepreneur Magazine in their 33rd annual Franchise 500. Our business concept has remained remarkably simple through the years: quality products yield quality results. What separates ABC Seamless from our competitors is the superior quality of our products. Instead of vinyl or other types of materials, we only use steel siding, steel roofing, steel gutters, and steel soffit and fascia. ABC Seamless only has to do a job once because we do it right and we do it with steel. Both our seamless steel siding and our seamless steel roofing have time tested durability – much like ABC Seamless. ABC Seamless created the seamless steel siding industry 36 years ago in Fargo, ND and began expanding across the nation in 1978. The mission of ABC Seamless is to create value for homeowners through their products. Imagine never having to paint the house or never worrying about leaky gutters. We are the industry experts and our expertise will give you peace of mind throughout the process of an exterior home remodel. ABC Seamless continues to grow because people know that they are getting a durable, quality product every time they call the duck at 1-800-732-6577.